Washington D.C. [USA] Mar 12 (ANI): The live-action adaptation of the Disney’s ‘Aladdin’ finally released its first full-length trailer on Tuesday. It is all things magical. New Delhi [India], Oct 12 (ANI): The teaser for Disney's live-action remake of 1992 animated hit 'Aladdin' is out and it introduces the audience a whole new world. 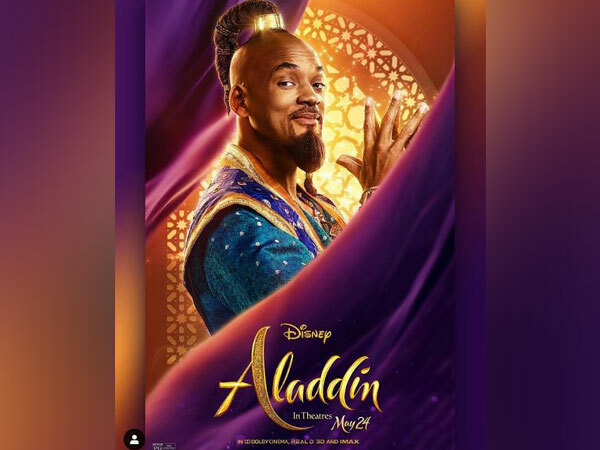 Washington D.C. [USA], Oct 11 (ANI): Will Smith has unveiled the first 'Aladdin' poster and it looks as magical as the classic tale. Who's playing what in 'Aladdin' live-action remake? Washington D.C. [USA], July 6 (ANI): Following the success of recent adaptations such as 'The Jungle Book' (2016) and 'Beauty and the Beast' (2017), Disney is all set to release live-action remake of animated classic, 'Aladdin'. New Delhi [India], May 13 (ANI): Hollywood A-Lister Will Smith became a household name with his sitcom 'Fresh Prince of Bel Air', but does anyone know why and in what circumstances he chose to do that show? Well, we might have an answer for you. Los Angeles [U.S.A], Sept. 13 (ANI): Disney has some made some huge changes in their calendar of releases. New Delhi [India], September 7 (ANI): Disney Fans, Will Smith has just granted your wish. Los Angeles [U.S.A.], August 5 (ANI): It seems like Disney has found the evil vizier to the sultan of the city for their upcoming 'Aladdin' movie. New Delhi [India], Jul 19 (ANI): Will Smith is 'magical' and his wife, Jada Pinkett Smith, wants the world to know that.